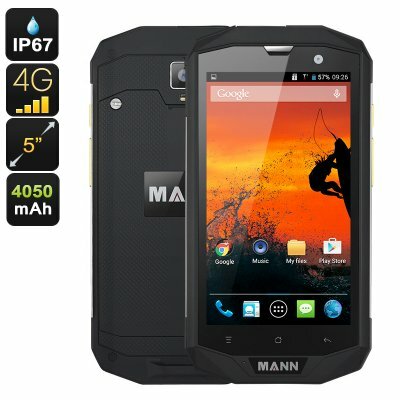 Successfully Added MANN ZUG 5S+ Rugged Phone - IP67 Waterproof + Dust Proof, Quad Core CPU, 2GB RAM, 4G SIM, 5 Inch IPS Screen, 4050mAh (Silver) to your Shopping Cart. MANN ZUG are no strangers to the rugged phone market so it comes as no surprise that the ZUG 5S+ is equipped with a great set of features. The MANN ZUG 5S+phones rugged credentials are clearly on display with the toughened exterior and metal side strips that are there to keep the phone safe from bumps and knocks. It is clear the phone is able to withstand a lot of punishment due to its reinforced build and IP67 rating that brings protection from water and dust ingress and will be able to withstand the hardships of working in mucky conditions or a wet environment. 4G connectivity brings super cellular connectivity letting you download data quicker than ever before. With a good spectrum of ranges covered the phone works in a number of countries and can keep in you connected even when venturing off the beaten path. Powered by an MSM8926 Quad Core CPU running alongside 2GB of RAM this smartphone offers a seamless performance and so you can enjoy games and movies without interruption. 16GB of onboard memory should be sufficient for most needs but thanks to the micro SD card slot you can add an extra 32GB if required so you can stock up on apps from the games store, download plenty of movies and have room for a comprehensive music library - all to keep you entertained. This waterproof smartphone has a 4050mAh battery which is essential for keeping it running while your away from a socket. With so much juice you will have plenty of usage time making it ideal for long weekends away adventuring. This MANN S5+ IP67 Smartphone comes with 12 months warranty, brought to you by the leader in electronic devices as well as wholesale rugged Android smartphones..